The Deming chamber of commerce has grappled successfully with the housing problem and there is now a cot, at least, for everybody who comes. In the role of gracious host that Deming has taken upon itself the threatened street sleeping danger has been averted, even though many of Deming’s fine homes have been turned into sleeping quarters. The price that these visitors have offered for quarters has put rooming house signs on a score of buildings that were never intended for the purpose. The chamber of commerce has taken steps to keep down the prices of rooms, as well as other necessaries, in conformity with its guarantee to the war department. An appeal to civic pride has sufficed to prevent exorbitant prices for necessities until the building operations can restore normal conditions. Many of the boom time restaurants that have sprung up are being conducted by Chinamen who are being content with a big business at the usual prices. These, as well as the tradesmen who have been established here before the rush came, see the permanent good to be derived from moderation of prices and the slump and danger that may result from a panic of money making. And yest, goodness knows, they could have doubled and triple prices if they demanded them. Money talks here, if it ever did anywhere. A busy contractor can afford to offer a good sized banknote to a man at the head of the line at the post office, to whom that hour or so delay for mail might not be so vital. Every business establishment in the town has tripled its force of clerks and yet cash for instant service is always to be had. Many a wise one who has found a room with a bed in it by dint of a day’s tramping up and down the streets has been able to realize a tidy sum by turning it over to somebody whose time chanced to be too valuable for the hunt. All these pressing problems are being taken in hand by the chamber of commerce, which is now forming a city housing commission. 3/6/18 Camp Cody. “A Major General is here from Washington, DC. I wonder how he likes it here. We have a review for him in the morning. Hope the sand blows twice as hard just to see how he likes it. I have to take a guy to the hospital in a few minutes. No I won’t have to walk but will take a motor cycle with a side car. …. 30 minutes later : just got back form hospital. I don’t care much about driving at night because of the poor lighting. Just looking at the hospital makes me feel that I would rather die than go in one. ….Six of us took a trip to the mountains yesterday. We sure had a good time. Left here at 5:00 AM and after 14 miles got to the foot of them at 6:30. It took us 45 minutes to climb afoot to the top. Was sure steep in some places. Some times we had to use ropes to pull each other up the side. In other places we had a rope around our bodies for safety; then hung on with fingers and toes to get around a wall. We ate dinner at the top. We found an old mine shaft which was certainly deep. It took a rock 30 seconds to hit the bottom. The trip was worth more than all the hardships. Will have to have my shoes resoled from the cutting of the stones. There was even snow on top. … Recently the K of C hall nearly burned down. It is only about two blocks from here. We were just going to mess for breakfast when it was discovered. A few of us got a hose card but it did not have enough hose. Another outfit came with more. I was on the nozzle end of it doing my best and getting really wet. I looked like a drowned rat but we had the fire out before the Deming fire department got there. The fire didn’t do more than burn the roof off. . In the meantime a piece of glass fell and got a piece of my nose. I patched it back in place and it’s still there. All the men asked me who hit me and of course had to kid me about it.” So goes life in Camp Cody. 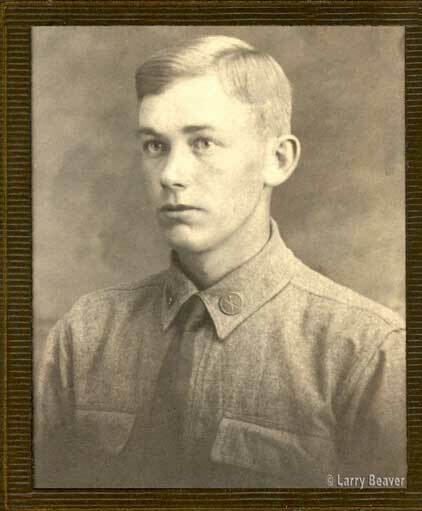 4/21/1914 Henry Harold Beaver joined the Nebraska National Guard with a six year enlistment. His birthday was 9/19/1897 so he was only 16 years old at the time. Lying about his age made it difficult in later years proving he was the same person with two different birthdates. 9/10/17 Henry Beaver left Fremont, Nebraska with his National Guard unit arriving at Camp Cody, Deming, New Mexico on 9/12/17 He had lied about his age and the army records show he is two years older then his actual age. He must have looked and acted his army age to be a sergeant soon after arriving at Camp Cody. Have a story about a WW1 “Camp Cody” army soldier to tell? This site is for anyone who wants to share the story of a friend or relative who served at Camp Cody in Deming, New Mexico. Clicking on ‘Comments” will allow you to communicate with others who are interested this WW1 Army Training Camp.